Every 3-hours from 250 miles off the Oregon coast, and 1 mile underwater, HD video streams in live over the Internet through the OOI’s Cabled Array in situ camera system. Live video streams of an actively venting hydrothermal chimney occur during the hours of 2:00, 5:00, 8:00, and 11:00 EDT & PDT day and night, for a duration of 14 minutes. In addition, as of November 2016, the camera now records for 24 hours non-stop on the 10th and 20th of every month, and 72 hours non-stop from the 1st to 3rd of every month, to examine animal behavior, diurnal/tidal cycles, and longer-duration changes in hydrothermal flow. Video Archive You can also access previously recorded videos in our archive. Files are sorted by date and available in .mp4 and .mov formats. We recommend downloading the compressed .mp4 versions. Time-Lapse Videos A new computer vision routine, developed by Aaron Marburg at UW-APL and aided by Tim Crone at LDEO and Friedrich Knuth at Rutgers, is now able to correctly identify and tag scenes of scientific interest in the CAMHD video stream. 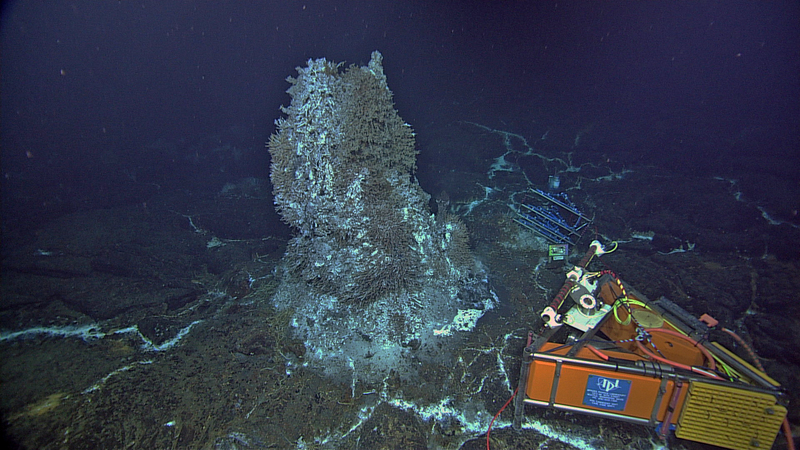 The HD video focuses on the 14-foot tall actively venting hot spring deposit called ‘Mushroom’ located within the ASHES vent field on Axial Seamount. The vent rests on an old lava flow. Radiating cracks in the flow are filled with white bacterial mats and small tube worms, marking sites of diffusely flowing fluids that issue from the fractures in the basalt. Axial is the largest and most active volcano on the mid-ocean ridge spreading center that forms the western boundary of the Juan de Fuca tectonic plate. Through the course of the 14-minute video the HD camera pans, tilts, and zooms to highlight different aspects of the south side of this metal-rich chimney that vents hot spring fluids at 260°C (500°F!). During this operation, the camera images the entire face of this animal-covered chimney. It focuses in on key areas of interest that include a small, high-temperature spigot near the base of the main chimney, the boundary between the base of the chimney and the lava-covered seafloor with snails and sea spiders, and areas hosting extremely dense assemblages of tube worms, palm worms, and limpets. In addition to the HD video camera, there are other sensors and instruments positioned around the chimney at the Cabled Array ASHES Medium-Power Junction box to help researchers learn more information about the impact that earthquakes have on hydrothermal vent fluid temperatures, chemistry, and flow rates, and the changes and behavior of macrofaunal and microbial communities that inhabit these areas. These instruments include an Osmosis-Based Fluid Sampler that provides long-term sampling of diffusely venting hydrothermal fluids. Once recovered, laboratory analyses provide major and trace element chemistry of these hot spring fluids. Next to the vent is a novel system that streams real-time temperatures to shore of the diffusely flowing fluids known as the Diffuse Vent Fluid 3-D Temperature Array. 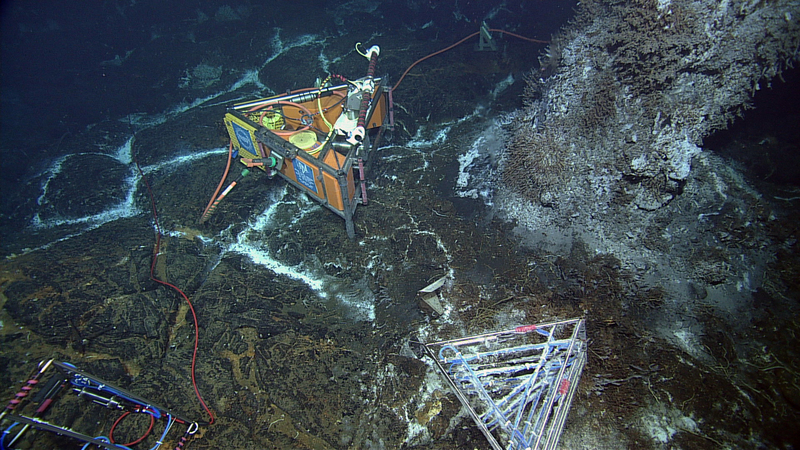 In addition, there are two Short-Period Ocean Bottom Seismometers that monitor earthquakes within the volcano, and the plumbing system for the vents during rise of the near boiling fluids. During the April 24, 2015 eruption of this volcano, over 8,000 earthquakes occurred over a 24 hr period! Learning more about the dynamic processes ongoing at this hydrothermal vent site will help scientists better understand the amazing creatures captured in the video, which thrive in one of the most extreme environments on Earth. Because hydrothermal vents, like the Mushroom vent, are too deep for sunlight to penetrate, the microbes have had to develop novel metabolisms that utilize gases (e.g. carbon dioxide, hydrogen sulfide, methane) and metals within the volcanically-derived hydrothermal fluids as their energy source. Indeed, these chemosynthetic organisms, instead of plants, form the base of the food chain.